Nachos are one of the best things to eat. Corn chips. Refried beans. Cheese. Salsa. Sour cream. All good things. This is pub food at its best. But I would never order meat nachos. I just can't imagine that much care has gone into the meat component. This theory holds for most public eating places, good restaurants excluded. Always the vegetarian pizza or the vegetarian kebab. I figure refried beans have either come from a can, therefore nice and safe, or have been made by some one who likes them themselves. Perhaps there is no rhyme nor reason to this, but there it is. My ultimate nachos include plain corn chips, not cheese flavoured or anything like that. Blue corn chips if I am lucky. Soak pinto beans over night in water. Drain and simmer in fresh water until soft. Drain, reserving some of the cooking water. Fry some onion, garlic and cumin in olive oil until soft. Add the drained beans and mash with a fork or potato masher or wooden spoon, adding reserved cooking water to achieve the consistency you like. Add some more garlic, black pepper and salt to taste. Cheese, whatever cheddar style is in the fridge. Salsa. Either red : made with red tomatoes, red onion, and red chilli or green : tomatillos, white onion, and green chilli. Or actually, you could have both. Sour cream, well actually we usually use yoghurt, strained overnight if possible. 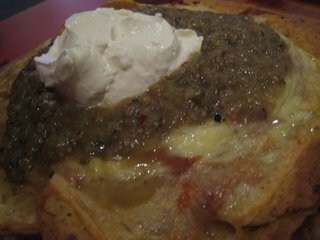 Spread the chips on a shallow oven proof dish, cover with refried beans, then the cheese. Grill until the cheese is bubbling and browning at the edges. Pour on some salsa, and a dollop of yoghurt. Eat with your hands.